Landers Chrysler Dodge Jeep Ram of Norman has a great selection of Jeep Grand Cherokees available! One of America’s all-time favorite sports utility vehicles, the all-new 2019 Jeep Grand Cherokee is sure to make tried and true Jeep fans very, very happy. With tons of new technology and lots of exciting upgrades to the available trims, you’ll want to take home the 2019 Jeep Grand Cherokee the very second you see it. So, what are we waiting for? Let’s take a closer look at the newest iteration of this classic SUV. Click here to view our available Jeep Grand Cherokee inventory now! Technology: Featuring updated technology that’s designed to keep you connected and safe, the 2019 Jeep Grand Cherokee is probably one of the safest Jeeps ever made. For starters, Apple CarPlay and Android Auto have made their way to the all-new Grand Cherokee, which means that music, phone calls, messages, navigation and more can all be accessed wirelessly through your Jeep. With the available UConnect 4C NAV, you’ll never get lost with directions displayed on a gorgeous 8.4” touchscreen. Steering wheel-mounted audio controls mean your hands never have to leave the wheel to change the song or adjust the volume, for even less distracted driving. Or you can choose to use Voice Command for effortless control of your phone calls and music. And, newly-introduced safety features such as rear cross-traffic assist systems and blind spot monitoring will ensure you’re always aware of your surroundings whenever you’re behind the wheel. Design: The 2019 Jeep Grand Cherokee will be available in seven unique trim levels for the ultimate customization and personalization: the Laredo, the Limited, the Trailhawk, the Trackhawk, the Summit, the SRT, and the Overland. The Laredo is the entry-level trim with 17” alloy wheels, fog lights, heated mirrors, cloth upholstery, and a leather-wrapped steering wheel. Stepping up to the Limited, you’ll also receive leather upholstery, LED fog lamps, ventilated front seats, and a panoramic sunroof. The Jeep Grand Cherokee Trailhawk comes with 18” wheels outfitted with all-terrain tires, power-folding mirrors, and gorgeous faux-suede and leather upholstery. Its more ferocious brother — the Jeep Grand Cherokee Trackhawk — is the supercharged version that features a hyper-powerful V8 engine and full leather interior. The Summit trim features high-quality leather in stunning colors plus luxe styling accents. When it comes to the Grand Cherokee SRT, a lower suspension with a mighty powertrain make this the ultimate on-road Jeep. And lastly, the Overland trim gives you the ultimate luxury Jeep experience with 20” wheels, completely unique styling, and some of the highest quality available leather imaginable. No matter which of the seven available trims is right for you, the all-new Jeep Grand Cherokee’s got an insurmountable and undeniable sense of style. Performance: Even when looking at just the starter powertrain that’s available, it’s plain to see that the 2019 Jeep Grand Cherokee packs a powerful performance punch. A 3.6-liter V6 engine comes standard in the new Jeep Grand Cherokee that pumps out 295 horsepower and 260 lb-ft of torque. If you choose one of the Overland, Limited, Trailhawk or Trackhawk trims, you’ve also got a couple ultra-powerful engine options as well. The turbocharged 3-liter diesel V6 engine that comes in the Limited, Trailhawk, Overland and Summit generates up to 240 horsepower with 420 lb-ft of torque, with the option to upgrade to an even more ferocious 5.7-liter V8 engine that produces a staggering 360 horsepower and 390 lb-ft of torque. The Jeep Grand Cherokee SRT features a wicked fast 6.4-liter V8 engine that generates a shocking 475 horsepower and 470 lb-ft of torque; and if that’s not enough power for you, the Grand Cherokee Trackhawk houses a supercharged 6.2-liter V8 engine that has an unbelievable output of 707 horsepower and 645 lb-ft of torque! At the end of the day, the 2019 Jeep Grand Cherokee will be a blast to drive regardless of which one you choose. Ready to take home your very own Jeep Grand Cherokee? 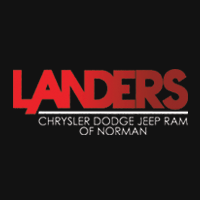 Visit Landers Chrysler Dodge Jeep Ram of Norman today–click here for directions!